A free couch. | there's no place like gnome. If you follow me on Instagram or Twitter, you’ll know I was all a flutter this past Saturday. I got a new couch. It was free. And did I mention awesome? Dave and I were out and about seeking the deals at the Austin city wide rummage sales. We found a few things. A metal tray and an old painting that I plan to turn into something new. We also ran into one of Dave’s friends at a sale who then took a naked Barbie from a garage sale free box and stuck it under Dave’s windshield wiper. So Dave, the naked Barbie on the windshield, and I were driving around when we stopped at a house. Everything was to go. They were moving and most of the house was empty; what was left needed to go. We walked inside and I saw it. The couch. I literally gasped aloud. I was in love. The owner saw my excitement. If I hauled it out of there, it was mine for free. It’s at my house now, sitting in the sofa spot in front of the TV. And no, it probably isn’t as comfy as my other (hand-me-down, free, kinda-falling apart, slip-cover-required) couch but really, for as little time as I spend sitting on it watching television, that might be okay. It needs some throw pillows and a couple other furniture shifts to make it fit in completely, but Dave was right – its home is here in my eclectic decor. 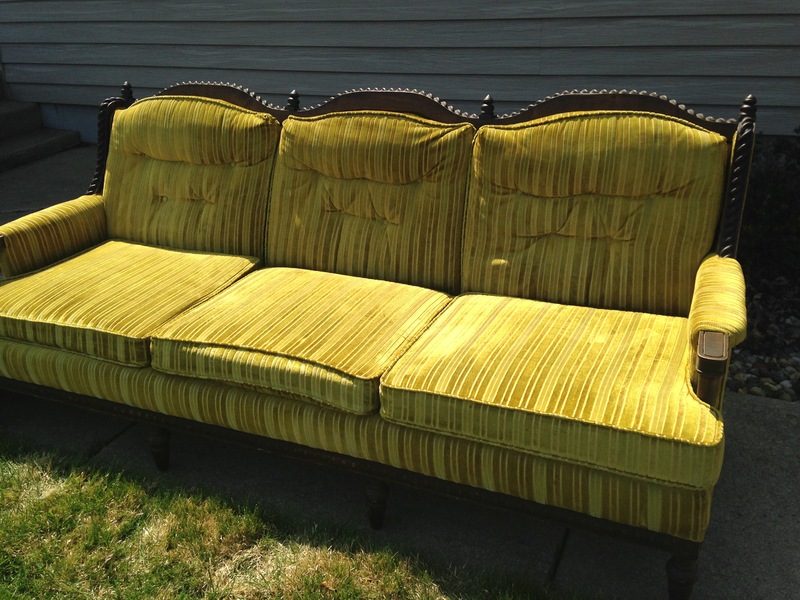 I’ll think we’ll be happy together, Mr. Green-striped-velour-ish Couch and I. Happy indeed.